Hey Android users! Since launching the Grammarly Keyboard back in December, we’ve heard from lots of you wondering about which product features would be added first. 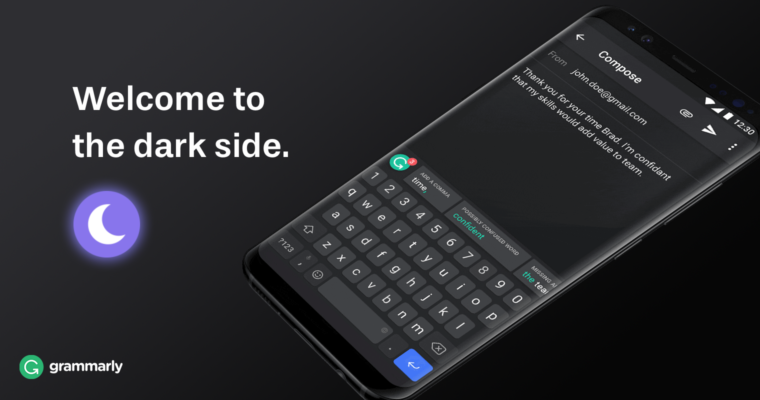 1 A sleek dark theme, so you can use the keyboard comfortably in low light. 2 Key borders to help with accurate typing. 3 A persistent number row. 4 The ability to resize the keyboard to take up less space on your screen. Check out the new options by opening the Grammarly app on your phone and tapping Keyboard Look and Feel. We know there’s one other feature you’re eagerly awaiting: swipe input (a.k.a. glide typing). We’re working hard to bring swipe functionality to the Grammarly Keyboard, but it’s not ready yet. Stay tuned for updates—we’ll be sure to let you know when swipe is here. Want to know more? Read on. We’ve rounded up the most helpful information about the keyboard and put it all in one place for you. What does the Grammarly Keyboard do? Whenever you type with the keyboard, Grammarly will check your writing and make sure your message is clear, effective, and mistake-free. For Grammarly Premium users, the keyboard will also suggest style improvements and vocabulary enhancements. You’ll see the suggestions along the top of the keyboard, and you can accept a change just by tapping it. If you want to know why Grammarly made a particular suggestion, you can open the correction to see an explanation. As you’ve probably noticed, the world has gone mobile. In fact, Internet usage on mobile devices and tablets is now higher than Internet usage on desktop computers. It’s clear that communicating fast and accurately through your phone is more important than ever, but when that involves composing a message, it’s still slow and inconvenient. We designed the Grammarly Keyboard to be a personal editor that works anywhere you write, no copying or pasting required. If you’re on an Android device, head over to the Google Play Store and download the keyboard. If you’re on iOS, download it from the App Store. Next, open the app on your phone and you’ll be guided through the set-up process. Need more detailed instructions? We have you covered for both Android and iOS devices. Can you see what I write on my device? The Grammarly Keyboard needs access to what you write in order to provide corrections and suggestions. We know that what you write on your device is private, so we have encryption and several other measures in place to make sure it stays that way. Additionally, the keyboard is blocked from accessing anything you type in fields marked sensitive, such as credit card forms and passwords. Does the keyboard support swipe input (a.k.a. glide typing)? Not yet—we wanted to give our Android users access to the app as soon as it was ready. But we do know that glide input is an essential feature for many Android users, so it’s something we’re working on. Keep an eye out for updates! I’m using the keyboard and I want to tell you what I think! Awesome! We love user feedback—it helps us focus on building features that are valuable to you. Let us know what you think in the comments below or on Twitter!